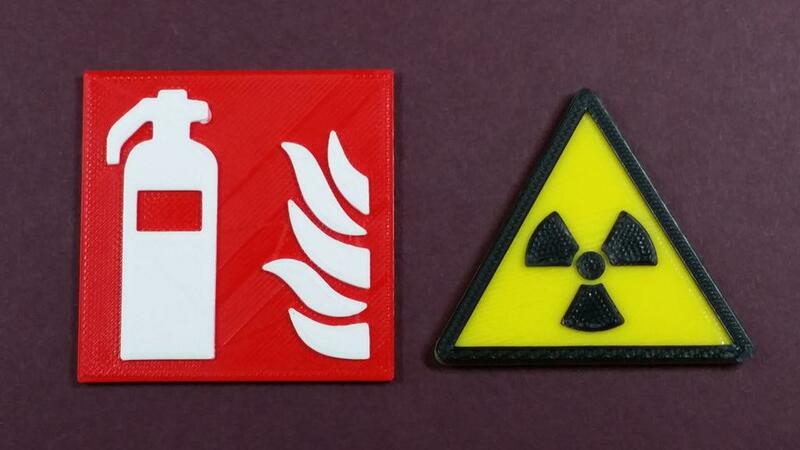 A good use of multicolor 3D printing is to make warning hazard signs. We tested Prusa’s application and had great results. STL sharing website Youmagine offers an extensive fire and warning signs collection designed by Obolski. These models have a thin base and well-pronounced animation on top. This reduces the printing time and saves filament. We can imagine that some remote places can benefit from 3D printing signs at their premises. Also, there might be a requirement for a customised themed sign that is not available ready-made. Of course, there is always a demand for funny – mock signs. 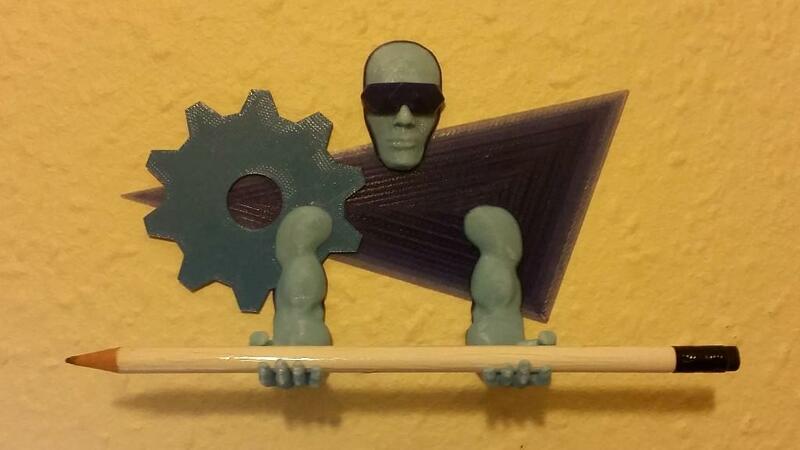 Multicolor 3D printing opens the doors experimenting and customising. If your imagination is good enough you can have unique funny objects around your house. Parties or seasonal events call for this type of originality, like a funny toilet sign or a do not disturb sign. Another area where multicolor 3D printing can be used is kids trinkets. It is possible to find all sort of decorations on STL sharing websites. 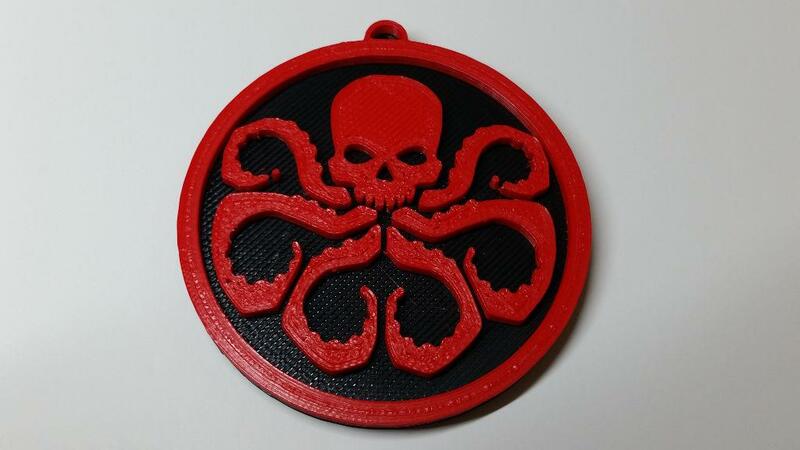 This Hydra pendant above comes from MyMiniFactory. It helped us to understand better particular slicing settings that have to be adjusted for each individual print. See our tips and tricks at the end of this article. We wanted to see if we could 3D print our logo. An image generator in Tinkercad, a design software for 3D printing, allows to convert a 2D image to 3D. It was not straight forward to make it print as our logo is textured with the uneven surface. As a result of several attempts we now have a two-color 3DWithUs magnet on our fridge. One of our young followers Gecko asked us to 3D print a YouTube play button. We promised that we will think of something YouTube related. 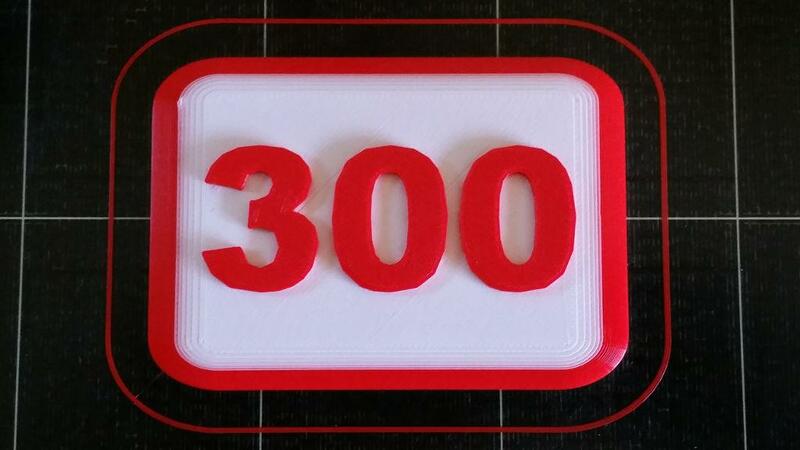 Then we agreed that once we reach 300 subscribers we will 3D print the sign. It was very easy to design it in Tinkercad. For this model we made two color changes: red to white and white to red. It looks cool, thank you Gecko for your idea. Now we can shout: This is Sparta!!! Then again we played around in Tinkercad with our previous design and as a result, we have another themed 3D printing accessory: a wall-mounted mini tool holder. Printable as 1 object plus goggles. Can be printed with the color changes to make a triangle, a gear, the body and the goggles in different colors. Easy to print, with 0.2 layer it takes only 2 hours. Mind the stringing. If you have stringing between the hands in the beginning, then there is a big chance that the fingers will fail. – It is important to guess correctly at which layer to pause for the color change. – 3D printing filament used for a multicolor object should be of the same diameter, preferably from the same manufacturer. – The material used should have the same flow qualities and should print at the same temperature if you don’t want to alter it during printing. – When scaling the sign models, consider only changing X and Y measurements. This will help to save time and material. – Wait patiently until both the heated bed and the object are completely cool before removing it, especially when printing in PLA. – When printing square-shaped thin objects, the warping may occur in the corners. We worked out that applying glue to the bed only following the perimeter of the object helps to avoid the warping and also excessive attachment to the bed. In our experience, too much glue made removing objects problematic. – Don’t despair if your 3D printer doesn’t have pause and restart function. Try to find a solution in different slicer software or on 3D community forums.